Working with Final Draft, David Marlett has created what he coined the Sphereplay, a template for scripting in 360 degrees spherically. Click on the images below to get your copy of the associated document/image. 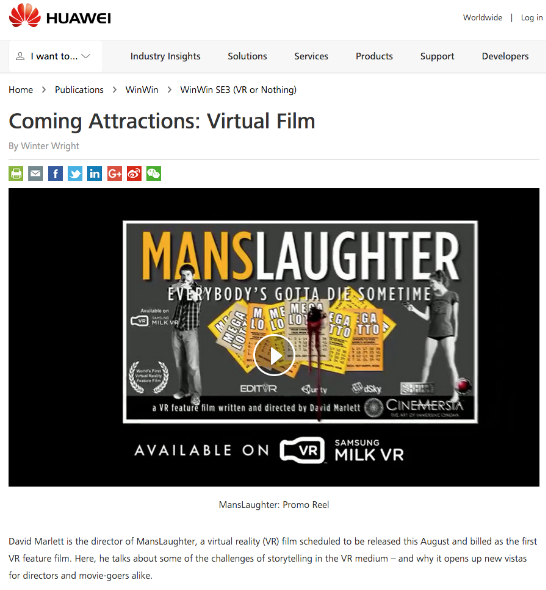 MansLaughter is the world's first live-action VR feature film. In this revolutionary, original, experimental film, you'll have a never-seen-before experience. Four people in tangled relationships learn a man who's won a $265 Million Mega Lotto is waiting to turn in the ticket. Delay is not his friend, nor are the other four as his caution gives them time for deception, double-cross and murder in order to claim the ticket for themselves. But who will end up with the money? Pay attention all around you to find out. 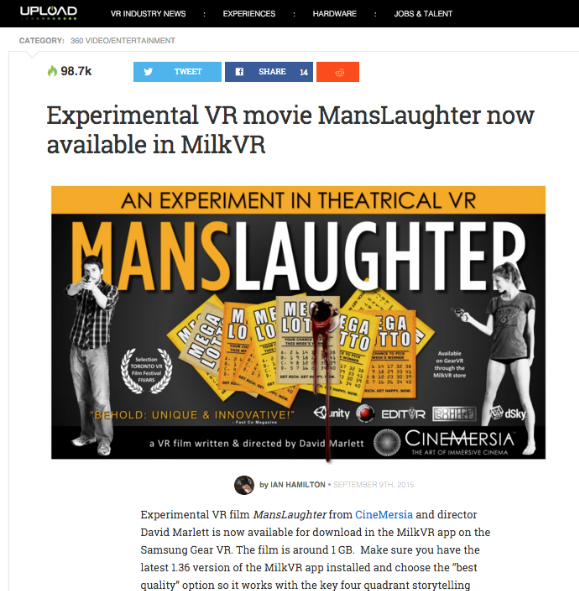 In 2015, David Marlett wrote, produced, and directed MansLaughter – An Experiment in Theatrical VR, the world's first live-action VR feature film (under the AMPAS definition). In the creation of MansLaughter, Marlett worked closely with Samsung VR in the the development of a unique quadraphonic soundscape for a 360˚ virtual environment. Subsequently, Marlett consulted FinalDraft in their creation of what Marlett coined a "sphereplay," a screenplay for spherical storytelling. "Behold: Unique and Innovative!" - Fast Co. mag. Three of the four simultaneously running scenes. In this first-of-its-kind, virtual reality feature film, you will be immersed on the front range, and out on the prairie, with the Arapaho people, as well as a contrasting nomadic reality on the Mongolian Steppe. In a powerfully unique story interweaves the story of a young Chinese man who has been taken in by the tribe. He is considered powerful as he is not only a good horseman, but has a trained golden eagle which he has named Tengri. In 1850, on the eastern front ranges of the Rocky Mountains, Arapaho Chief Two Mountains lifts prayers to the Sky Spirit for both the day's coming hunt, and to recover his wife, two outcomes that cannot both happen. As his people are starving, his small hunting party must find the buffalo trail. And yet his wife, Singing Wind, was taken by a Pawnee raiding party over two moons prior and remains lost. Every ride out, every hunt, is a chance for him to search new ground, to seek any sign of her. Today he feels she is near. Come soar over, in, and around this proud tribe in this tense adventure. You decide which of the two alternate realities will happen: the hunting path, where they won't find Singing Wind, but do find the buffalo trail; and the war path, where they attempt to rescue Singing Wind but miss the buffalo. Each holds dire consequences for them all. Filmed in stunning HD4K - 360˚ spherical, this live-action feature film will take you where no other has been (yet): back 165 years, out on the prairie among this proud Native American tribe, and around the world to the other nomadic horsemen, the people of the Mongolian Steppe. Once inside, you'll never be the same. In this gripping, first-in-the-world, hybrid framed/VR series, experience humanity and machine in a combination of traditional filmmaking and virtual reality cinema. Master Sgt. Marina Peters was just doing her job. As a U.S. Army Special Forces Drone Ranger, she came to work each day in fatigues, ready to do battle, ready to assault an ISIS target, ready to save the day, ready to kill if necessary, whenever and wherever she was required to go...in Tampa, Florida. Then she would drive home each night, half-baked, to her children and her crumbling marriage. But when she was on base, in that contact room, Marina was a force to be reckoned with...thousands of miles away. There, inside her assigned DX, her battle drone self, she was invincible. Or so she thought. So we all thought. Until that Tuesday at 13:16 in the morning on that goddamned, windswept mountain in Syria. INNERDRONE will offer a highly unique experience to audiences. First, the audience will experience the premium, top quality, live-action drama series in Traditional Framed Media (TFM) such as televisions, tablets, laptops, etc. This will be similar to any other such series such as Homeland, Game of Thrones, etc. All scenes from within the point of view (POV) of the battle drones will be seen as the director chooses to allow the audience to see them. Live-Action. Immersive. Hybrid Mediums. Original.